This week’s review is Space Base, by AEG. A great dice game that blows Machi Koro out of the park. I’d the BSG game “collectible” like X-Wing or is it more self-contained? It’s technically collectable but there isn’t the same ship variety in the BSG universe for it to be a problem for me. Flying a single ship per player is more interesting than X-Wing thanks to the physics model, so even the starter box is good for 4 players. Did you paint that viper or does it look that way out of the box? No way could I paint like that. Does anyone use playmats for any of their games? I’m wondering if a set of playmats might be a useful accessory for my gaming closet. I think they may have come in handy with Terraforming Mars. I’m also torn between just grabbing a bunch of black mats or trying to grab 5 different colors that are most often found in games (blue, red, green, yellow, black, maybe). Went to Terminal City Tabletop Convention here in Vancouver this weekend. Got 12 games played! Is it Camel up or Camel Cup though? LOL the new 2nd edition definitively answers that one. Yeah, does anybody use playmats? We are going to get a new kitchen table soon, but is ons with a work down look and feel. The surfaces isnt flat, so I have the same question. Would like to hear some opinions if there are SP-ers who use one. Do you mean like textured mats to stop stuff sliding around, or game specific mats? I’ve played on a TI4 mat and it worked really well. Kept the hexes in place better than a table would, considering how much movement they endure over the game. The previous mats owner also has a scythe mat which is for big tables only. I’ll ask him his opinions next time I see him. I can’t speak to the value proposition (or even space proposition) as to whether they are worth owning. Playmats are usually good, but they’re also not usually neoprene despite being described as such, and they’re usually expensive. I’ve got a few dedicated ones and a couple of generics (I use the same one for X-Wing and BSG for instance). Storage tends to require they be rolled up, so a poster tube may or may not be problematic when it comes to storage for you. I’ve played on the usual “neoprene”, felt, and a gripmat, but for individual player boards, I have some trays of my own design which have a textured felt bottom and a card holder built into the lip on two of the edges. I love my trays for certain games—as a way of keeping the AHLCG play area organized and relatively portable, for example, they’re fantastic. I originally designed them for Arkham Horror, but any game with a small character sheet and some cards (like Mice and Mystics or Imperial Assault) benefits from them. I suspect I’d appreciate the playmats less, but still somewhat. 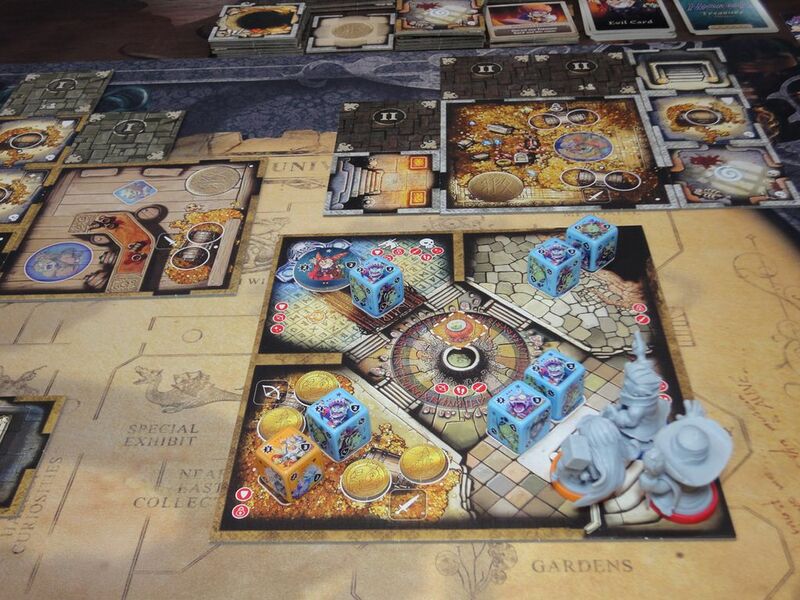 For the big surfaces, I like the gripmats best for tile-laying or randomized-board games, as they are the grippiest. A little prone to scratching, though, and it seems to take longer for them to relax to fully flat after being rolled up than I’d like. The neoprene with cloth on one side is perfect for games like X-Wing—stuff doesn’t seem to move around unintentionally as much as on a bare tabletop, but it’s still easy to slide them, and the surface is smooth enough that it takes images pretty well. Felt traps debris, and slides around too much—I wouldn’t use it at all, but the piece I have is blue and large, so Sails of Glory looks great on it. In my original question, I was referring more to individual mats, like CCG players use. I don’t know what they are made out of, but I was leaning towards the Ultra Pro mats since they seem to be the industry standard. I’ve got a generic star field large mat that I use for X-Wing, though I’ve thrown it on the table for other games like Cosmic Encounter. I was just considering whether or not it would be nice to have individual mats that each player could use for some of the games where there is a lot of individual card play or tableau building. Terraforming Mars was my original thought; you don’t need a mat for the game board, but each player has so much going on in from of them that if mats truly are helpful, it might be nice. Considering that a set of mats would end up costing about as much a another game, though, I was looking for opinions. I’d check etsy for custom player boards in that case. There are lots of options for TFM. I have one as I only have one player who needs a player board with recesses. I have the Fantasy Flight Games gamemat for Elder Sign (which I’m a sucker for maps, museums, & Lovecraft ) as well as their larger one for Arkham Horror 3rd Edition (I didn’t plan on getting it, but it was there at my FLGS, which is “local” in the definition that I can make a special expedition to go there, so it was a bit of an impulse buy when I saw it). I love the gamemats for ease of picking cards up off the surface. If I was playing them more, I’d also like to get individual mats for each hand. 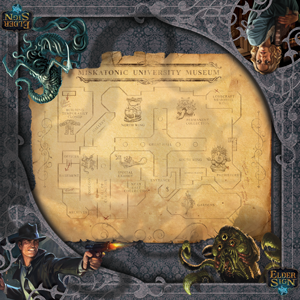 The files sections of BGG often have nifty designs to download and then submit with an order to Inked Gaming for printing on a mat. 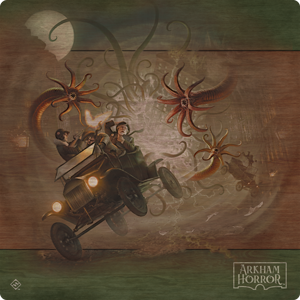 I also have seriously considered the Canadian artist Andresia Garnier, who runs MomoMonsterCo on etsy, who has one design that is shown being used for Elder Sign, Eldritch Horror, Mansions of Madness 2nd Edition, as well as Arkham Horror 3rd Edition hands, as well as other designs for AHCG and others. I’d have to go generic because I’d use them for multiple games. There are certainly some great designs, though.